We don't often put the words "sublime" and "planter" into one sentence, but this is the exception to the rule! This exceptionally beautiful mid century planter was designed by Willy Guhl in the early 1950's. Hexago is a hexagon shaped planter which allows for wonderful compositions, ideal for landscaping. But Hexago looks equally stunning as a unique piece in the garden. When we first found this planter, it was love at first sight! This modern planter is a classic in the history of modern design. 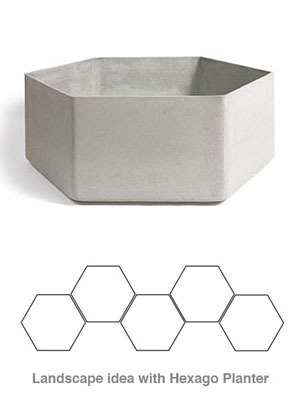 The Hexago planter was designed by Willy Guhl in the early 1950's. These fantastic modern planters took Europe by storm and chances are you will find them just about anywhere in Europe in public places, private gardens, Swiss and Italian lake front estates and hotels, spa resorts and plenty of mid century modern homes. This is one of the most iconic modern design planters that was ever created. The Hexago planter is a perfect composition with blends style, grace, functionality and industrial design into one attractive package. The Hexago planter is the eternal classic modern design planter with its structural clarity and timeless form. This fantastic modern planter would look amazing at a pool side, garden terrace, patio, hotel entrance, private residence or even in large loft spaces. It is perfect for both indoor- and outdoor spaces. This modern planter is handmade and imported from Switzerland. This planter is made of fiber cement which is a mostly organic material and it is 100% recyclable.